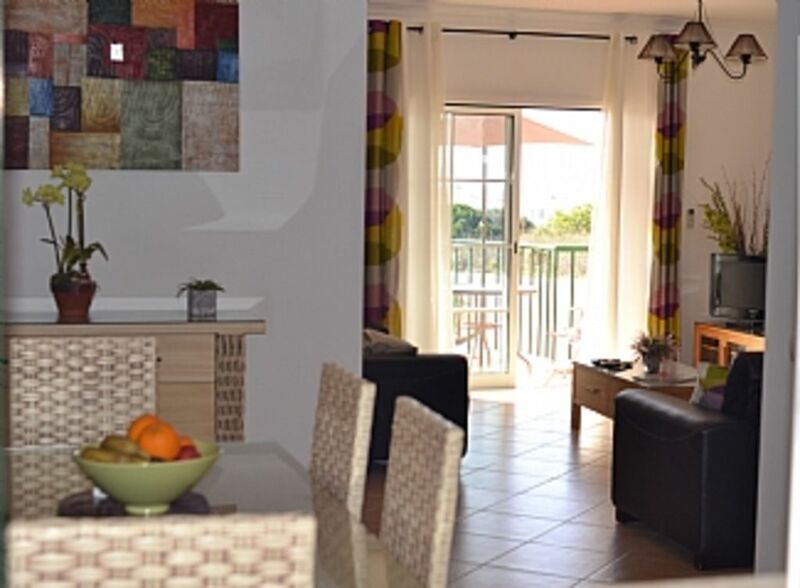 A modern 2 bedroom apartment in the village of Praia da Luz. The apartment consists of 2 bedrooms, 2 bathrooms (1 en suite) living room with double sofa bed separate dining area, kitchen with all modern appliances, 3 balconies all with sea views (1 with outside dining table). The complex consists of 1 large communal pool, 1 children’s pool and play area, there is also a cafe and a pool side cafe (all seasonal). The beach, restaurants and bars of Luz are just 5 mins walk away and the town of Lagos is just a 10 mins drive. The various golf courses that are on offer are within a 30 mins drive. En suite bathroom to bedroom 1 with shower, wc and hand basin. Main bathroom with bath/shower head, toilet, bidet and hand basin. Free satellite TV, DVD player, breakfast bar, double sofabed and balcony with sea views. Consists of fridge/freezer, oven, hob, washing machine, microwave, toaster and kettle. Plenty of books in the cupboard please feel free to help yourself, swop and leave yours for others to read. Lovely balcony with seating for 4. The balcony also has a sea view. Boat trips available from beach and Lagos harbour. There are a large number of golf courses within the area and are within a 30 minute radius. There are 2 ramps leading to the property which would be suitable for a wheelchair. Notes on accommodation: Fully air conditioned heaters available in winter season, suitable for children. Outside: Balcony with table and chairs 4/6. Cleaning / Towels / Linen / Maid service: A full clean is done on the day of your arrival this includes clean sheets and towels ( Sunday charge 30 euros ) Any extra clean can be arranged and paid for locally. Other: There is a seperate dining area off living room with dining table seating 6 people. 2nd stay here - hope to come back again! Lovely clean apartment. Has everything you need for a great holiday and is a short walk to the beach and so many good restaurants and bars. Luz has become our favourite place. Thanks for another lovely stay. Really nice, cosy, and comfortable apartment. Well located, sun all day. Excellent location, central to everything in Luz, allowing a car free experience if desired. A delightful apartment. Tastefully furnished, extremely comfortable and every need catered for. Great location with super views. A joy to spend a week in. St James complex is lovely - very pretty, great pool and always plenty of sun beds and perfectly located, only 5 mins stroll to beach and many fantastic restaurants. The apartments inself was wonderful - everything we could possibly want was provided, spotlessly clean and lovely sea views and the communication with the owner was very easy. Praia da Luz is one of the nicest resorts we have visited - we travelled with teenage children and there was something for everyone - watersports, beautiful beach, restaurants bars and easy access to Lagos and other excursions. Thank you and we hope to return. Lovely weeks stay in this great apartment, close to all amenities. Use of quiet pool was a bonus. The pretty beach of Luz is a 10 mins walk away. There are numerous other beaches close by i.e. Burgau and Salema or for those who wish to explore the stunning west coast beaches these can be reached within a 40 mins drive. The nearest airport is Faro. The transfer to the resort either by car or taxi takes approx 55 mins. Car hire is not essential but is highly recommended in order to see the true beauty of the Western Algarve. Please note that the main motorway in the algarve is now a toll road and the cost to Lagos is 6.75 euros. The town of Lagos is a 10 mins drive away, for the more adventurous Seville is a 2.5 hour drive away and is well worth a visit.The mountain area of Monchinique is approx 30 mins away and the historic town of Silves is 40 mins. the western Algarve beaches which are excellent for surfing can be reached within 30 mins. Booking Notes: Payment can be taken in sterling or euros. We require a £100 non refundable deposit per week with the full balance being due 8 weeks prior to departure. A £100 breakages fee will also be taken at the time of the balance this will be refunded once apartment has been vacated and checked.If the apartment needs to be cancelled prior to departure the following cancellation charges will apply upto 8 weeks - loss of deposit 8 weeks - 4 weeks 50% loss 4 weeks - 2 weeks 75% loss 2 weeks - 0 100% loss Changeover Day: The changeover day is flexible. A charge maybe charged for a Sunday changeover.The apartment can be obtained from 13:30 on the day of arrival and vacated by 10:30 on the day of departure. Late departure maybe arranged in advance. Notes on prices: Prices are for the property per week in UK Pounds. The price of the apartment includes 4 pool passes if you require extra they can be paid for locally at 15 euros per day or 35 euros per week.